A ceremony was held Friday afternoon in Exposition Park to welcome the Expo Line as the latest Metro Rail project to grace the transit scene in Los Angeles County. The Expo Line opens to the public on Saturday morning at 5 a.m. There will be free rides to the public on both Saturday and Sunday from 5 a.m. to 7 p.m. with regular fare service beginning Monday. Details here. Many public officials were on hand Friday at the Expo Park/USC station, including several aboard a train that broke through the traditional ‘first train’ banner about 1 p.m.
•”The opening of the Expo Line is a central step toward a 21st century transit system this region deserves,” said Los Angeles Mayor and Metro Board Chair Antonio Villaraigosa. “We can and will do much more,” he added, citing Thursday’s vote by the Metro Board of Directors to certify the final environmental studies to two other rail projects, the Regional Connector and Westside Subway Extension. •County Supervisor and Metro Board Member Mark Ridley-Thomas noted that Expo Line will be the first train to carry passengers to the Westside along Exposition Boulevard since late 1953. He also noted that while the region recognizes that this past week was the 20th anniversary of the 1992 riots, it’s also important to recognize that the Expo Line is a big investment in the communities along the route, including South Los Angeles. 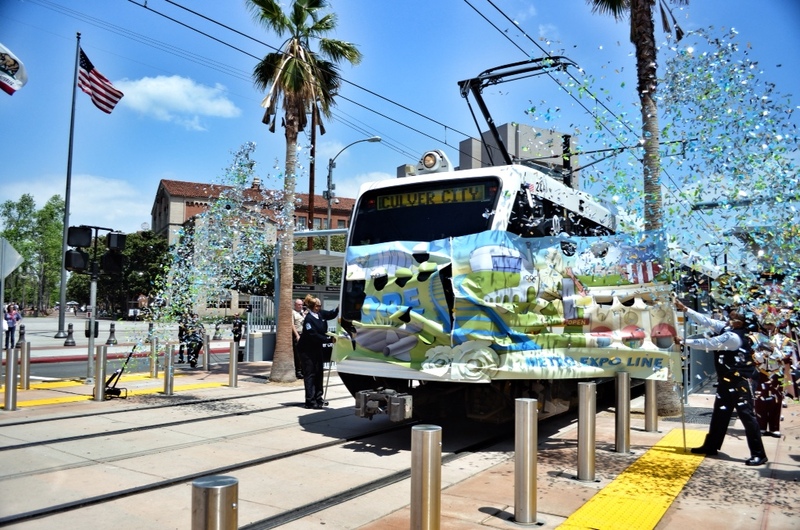 •”Thirty years from now this line will be remembered as a line that carried tens of thousands people [each day] and it will also be one of the busiest lines anywhere, not just in Los Angeles,” said County Supervisor and Metro Board Member Zev Yaroslavsky. “This is the golden age of transportation in Los Angeles,” he added, noting that each of the rail lines expected to open in the coming decade is a down payment to Los Angeles County voters who approved the Measure R half-cent sales tax increase in 2008. It would have but awesome if the source had told the public about the ribbon cutting so we could attend. I asked all around on twitter and comments on LAist about when the “ribbon cutting” was going to be, and then I found out about it after the fact. Very sad that this wasn’t made public. Like Ezra, I am very disappointed that the ribbon cutting / banner breaking was not announced. I would have loved to have been there, especially since I was just a little ways away at USC and had no idea. so i guess we are sticking to the name expo line? and I was expecting to be given color to be named after like aqua. That’s correct, Shark. The Metro Board elected to stick with “Expo Line” as the name. Yeah, they twitter the announcement only a few hours before the event, thanks a lot. I believe metro didn’t want the public to know. The event was intended mostly for politicians and community leaders. Bummer, I missed a great photo-op. Very disappointing that the station at Dorsey High on Farmdale is not open yet, no surprise, I saw the workers yesterday still working on it.